Continuing to the northeast, we arrived at the City of Jupiter, which is intersected by many bodies of water (see Google earth photo below). The State Route 706 Bridges (FDOT#930453 and #930454) are two parallel bridges that include slab end spans, precast girder approach spans, and single steel bascule spans across the Intracoastal Waterway. These bridges were built in 1999, they are 1344 ft long, and they have many architectural features. The piers supporting the bascule span are very large, painted pink, and with big platforms for pedestrians to look at the waterway. This part of Jupiter would be quite lovely except for the downtown area north of this bridge is being rebuilt. This made it difficult to get a good elevation view of the bridges. I had to walk out on a partially demolished wharf covered in vegetation to get a photo of the bascule span. 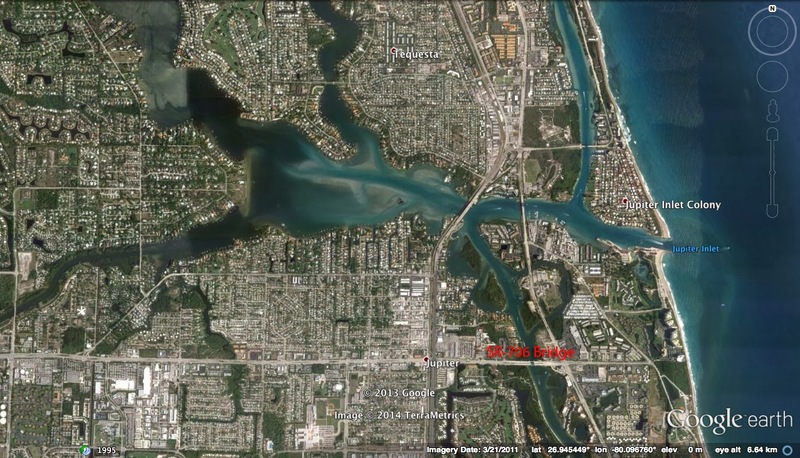 Palm Beach County, Florida Bridges: State Route 706 Bridges across the Intracoastal Waterway by Mark Yashinsky is licensed under a Creative Commons Attribution-NonCommercial-NoDerivatives 4.0 International License.